The 90 Day Fiance recap starts with Larissa Christina fat-shaming Colt Johnson‘s cat, Cookie Dough. Ashley Martson and Jay Smith hang with his proudly promiscuous father “Skinz”. Asuela Pulaa is grilled for dinner while Eric Rosenbrook buys a lone cheesesteak to feed four. Let’s dig in! As 90 Day Fiance starts, Larissa Christina has been in Vegas for less than three hours and hated every second of it. Colt Johnson is driving them to the house where he lives with his mother-wife Debbie. He asks Larissa to stop complaining. The toothy Brazilian doesn’t. They arrive at the subdivision in the desert and are greeted by excited mother Debbie. 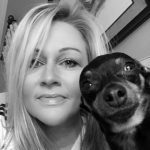 Debbie Johnson’s tears of joy turn to sadness on 90 Day Fiance when Larissa Christina examines and persecutes every aspect of their home and life. Larissa hates the unseasonal Christmas stuff, lack of couch, and ubiquitous wolf statuary. Colt says they left it undone for Larissa to decorate. Larissa insults the one-armed bandit in the dining room and demands a bigger house with a pool. Colt tries to impress Larissa by showing her that the house has stairs. Oooh aaah. Perhaps he thinks they don’t have those in Brazil. 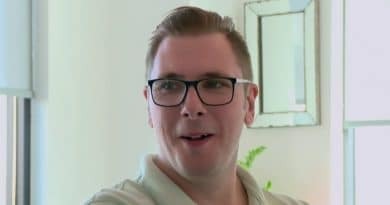 Colt Johnson tells 90 Day Fiance producers that this transition isn’t going to be easy because he and his mom “had our thing going for many years”. Sounds like Colt should have broken up with his mom before landing a new lady. Debbie made beef stew but instead of dining, Larissa went to stew upstairs. Colt decides to dig in and compliments the dank dish. Debbie cries like a wife whose husband just moved his mistress in. Larissa confesses it’s not good for Colt to live under Mommy’s skirt. The 90 Day Fiance creep factor here is off the charts. In the morning, Larissa Christina is displeased to find Colt’s other woman in his bed. It’s adorably pudgy feline Cookie Dough. She is no fan of the puss and tries to shoo her away. Larissa’s claws come out and she calls Cookie Dough fat. Colt Johnson tells her not to fat shame his precious pussycat. It’s one thing to insult Las Vegas, his car, his house, the decor, the slot machine, the beef stew, and his mother. But damn it, you leave Cookie Dough alone! Starving since she spurned the meat soup, 90 Day Fiance had Larissa waking hungry. She cooks a breakfast of sloppy sammies in spite of admitting she lied about her cooking skills. Proud of her eggy concoction, she pressures Cole to go get Debbie to eat with them. Debbie begrudgingly downs the dish while schooling Larissa on Colt’s dietary preferences. Debbie says Colt doesn’t eat bread in the morning but prefers bacon, eggs and cauliflower hash? Is that even a thing? She suggests Larissa learn about Colt’s meal expectations. For her part, Larissa seems to want to slim down the cat and her 90 day fiance. Larissa says Colt doesn’t need to eat like a king in the morning. And with that Debbie is left with a little egg on her face. Jay Smith and Ashley Martson walk the streets of Jamaica in their final days as they prepare to head to America. Jay’s K1 90 Day Fiance Visa was approved. He reveals in his confession he has always dreamed of coming to America. Jay will leave family behind, including his Dad Conroy. The couple nosh on some delicious street pineapple and Jay rings up his dad. Jay explains to Ashley Martson while they wait that his Dad has earned the cringe-worthy nickname of p-word skinz. The sleezy moniker was bestowed on him because he is a self-admitted man-whore. Jay tells producers he used to be like that too but now wants to be a better man. Skinz gives his son the advice of always having respect and manners for your lady. Something he clearly knows nothing about. On 90 Day Fiance, Ashley and Jay say goodbye to his family including pregnant sister Poochie. They arrive in Mechanicsburg, PA on a frigid night. Jay is not prepared for this after spending his life in balmy Jamaica. He says he can even smell the coldness. They discuss the racial tensions they both fear as Ashley’s neighborhood is suburban and mostly white. Jay says he wants to go jump in the snow in his undies. but wonders if the neighbors would call the police. Ashley explains you can’t run amok in your drawers in America. Jay thinks Ashley’s house is like a five-star hotel. He makes carpet angels and jumps on the bed like a child on a sugar high. Ashley confides she’s been alone a long time and wonders how it’ll be to have him there 24/7. Next, on 90 Day Fiance, Steven Frend arrives in Russia confused. He has a 7-hour train ride to get to reach Olga Koshimbetova. He needs help getting to the train and gets a little discombobulated trying to figure out left and right. Because you know sides swap in Russia. Oh, wait… Um… Eventually, Steven gets on the train with a camera crew in tow. He wonders if there will still be a spark there when he reunites with his very preggo summer fling. Watching Steven and Olga, it’s easy to wonder if you’ve flipped to MTV USSR to watch ‘Teen Mom: Soviet Union Edition’. Steven brought everything he needs – Russian rubles and a skateboard so yeah, he’s ready to be a dad. We pick up right where we left off last week with the MD native. Olga can’t wait for Steven to arrive in the flesh as she’s spent a long nine months of her pregnancy alone since she left Ocean City. She reveals in her confessional that she spent time in an orphanage as a child which brings her to tears. This is an unusually sad revelation for viewers of 90 Day Fiance. Steven steps off the train and Olga is there to surprise him – big belly and all. They take a taxi to Olga’s apartment which is tiny – she’s still in college. The camera crew must be standing on furniture to film. Steven unpacks what he brought for the baby. He got her a donut-shaped boppy and a burpee cloth to cover her up while she breastfeeds. It’s not enough. Not near. Steven is clueless about what it will cost to raise “an entire baby”. He also thinks the baby will arrive smack on the due date. Olga whines “Steven I don’t know” when he asks when the baby will come. Plus he’s upset that Russia is back in the 50s on childbirth protocol as baby daddyies don’t come into the delivery room. He wants to be there, but he needs permission. The young 90 Day Fiance couple made a list and embark on a shopping trip to Bolshevik Babies R Us. On the list: socks. At least the kid’s feet won’t be cold. They choose various things for the baby and Steven shells out a thousand rubles while wondering if that’s a lot. Raising an entire baby ain’t cheap in any language. Olga says more, more. Steven says no, no. He wants a receipt to bring things back they don’t need and Olga says you can’t do that here. So to summarize. Nyet on store returns. Nyet on the dad in the delivery room and nyet on an entire baby. Poor Steven. Poor Olga. Great for 90 Day Fiance viewers. Eric Rosenbrook, Leida Margaretha, and son Allesandro smile in Philly. Sister Reina, the thief of all joy, snaps pics for her complaint journal. At the Reading Terminal Market, Allesandro rides high above it all on Eric’s shoulders as they leave the sisters to go procure some lunch. Reina does her best Debbie Downer impression once Eric is out of earshot. She thinks it’s all bad and Leida needs to get her a** back to Indonesia. She asks what’s her sister’s Plan B if her 90 Day Fiance doesn’t work out. Leida says it’s all Plan A and will be fine. Then Eric fuels Reina’s fire by slapping down one Philly Cheesesteak for the four of them to split. To be fair, that monster sandwich probably could feed an entire village. It’s got to have 5000 calories of meat, cheese, bread, and onions. They’re not sure how to touch or eat it, but little Allesandro is all in and says “yum”. Speaking of family, Leida confides to Reina she doesn’t understand why Eric must pay child support. This isn’t a thing in Indonesia. Despite Eric telling her that it is very much a thing here in America, the highly educated Leida can’t seem to warm up to the idea that taking care of your own flesh and blood is a good thing to do. 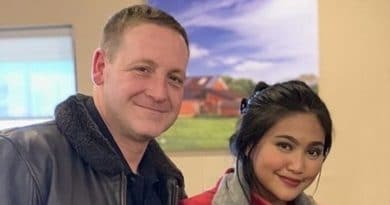 90 Day Fiance fans raged on social media about this. Now it’s time to pick up the ‘rents. Eric met them back in the motherland but this is new turf. Leida’s parents, like Reina, are not ‘Team Eric’. They don’t even know yet that the pasty midwesterner doesn’t have any money. Looks like Eric got the luggage in proper because Leida holds back on a fit. Leaving the airport, Eric rolls over a curb prompting Leida to ask why he did that. He claims the truck was built to roll over parking lot curbs. Maybe they can all split a Mentos now. It’s gonna be a long ride. Fernanda Flores can’t work in the US yet due to Visa restrictions. She’s bored and misses her boozing and fun friends. In ‘merica she can’t even drink. Fer says Jonathan’s friends are not fun – as we saw first-hand on last week’s episode at that disastrous dinner. She wipes counters and cores an apple before going to meet Jonathan’s gal pal Dani for some shopping and girl talk. Dani does her best to be nice to the stunning 19-year-old Mexico native, but you can feel the jealous undercurrent a mile away. Fernanda tries on a dress and digs at Dani for info about Jonathan. She doesn’t understand why at 32 he never settled down. Dani reiterates that Jonathan told her he didn’t want to get married but did want a family. The eternally on the verge of tears Fernanda brings up the “tong”. Dani conceals her delight upon hearing this tidbit and defends Jonathan for just being a “dumb boy”. Fernanda skypes with her mom and little brother who calls her dog face which gets a laugh from the tong-tormented beauty. Her mother works a lot, so Fernanda was caretaker for him and their sister. In a very cute yet sad moment, Fernanda asks why he wouldn’t wake up when she kissed him upon leaving Mexico. He says it’s because he was dreaming she would stay. When it comes to talking to women, this kid has more game than Jonathan will ever have. Fernanda shares with 90 Day Fiance producers that they will marry in Chicago so her family can’t attend. The skype call ends with Fernanda asking her mother if she is sad about this. Of course, she is and now Mom’s crying too. Fernanda hangs up and sobs as Jonathan comforts her. In sunny Cali, Kalani Faagata teaches Asuelu Pulaa the finer points of diaper changing. Asuelu tells producers in his aside that in Samoa it’s primarily the women who are on baby duty. He mimics Oliver crying and says that he’s been cranky. Kalani’s mom takes Oliver so the two can hit the beach. Tonight will be the dreaded family dinner where Asuelu will break bread with her very scary braided-beard father and miserable sister Kolini. It’s finally time for Asuelu to meet Kalani’s dad face to face. Her dad and sister walk to the dinner together and her Dad says he hopes he’s not a jackass. Takes one to know one. After extremely awkward introductions, Asuelu breaks the ice and apologizes for knocking up Kalani. He vows to care for his little family and says he has experience in construction. That’s surprising because Asuelu house back home has no walls. Kalani’s dad spews some nonsense cliche about milk is expensive and honey ain’t sweet. He warns him not to disrespect his daughter or his family. He barks at Asuelu about whether he loves Kalani. Asuelu says he truly loves her and wouldn’t be here if he didn’t. TLC times awkward pauses into editing that probably didn’t exist. Asuelu sways baby Oliver to soothe him during this extremely awkward dinner/interrogation. Kalani’s mother notices that sister Kolini looks “tortured”. After making a face that looks like she just drank curdled milk she does a wave of disgust towards Asuelu and his baby son. She says she doesn’t think that he should think he can just immediately be a father. Umm, excuse me, he IS Oliver’s father. She pouts that for five months SHE was his father. Sorry to break it to you but you are the baby’s AUNT. Step off, please. There’s a low-rent Kardashian vibe rolling off these people from Kalani’s deadpan on the beach while Asuelu bawled to Kolini’s mascara-laden glares. This couldn’t get much better. Poor Asuelu has no idea what he’s in for and we can’t wait to watch. That’s it for the 90 Day Fiance recap of Episode 3 of Season 6 ‘Rough Landings’.